Washington, D.C. (April 28, 2016) – LIUNA Local Unions in the United States and Canada are working to collect donations and support relief efforts in Ecuador following the devastating earthquakes, which left hundreds dead and thousands missing. 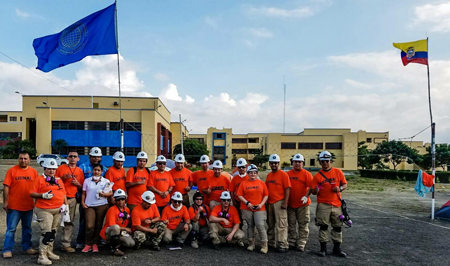 A disaster relief team of twenty LIUNA Local 78 members and a six-person technical assessment team from Local 79 are now in Ecuador assisting in assessment, clean up, and recovery efforts. LIUNA Locals 78 and 79, which represent construction workers in New York with specialized training in structural assessments, demolition and hazardous materials remediation, are providing skilled assistance on the ground in Ecuador removing debris, remediating dangerous substances, searching for survivors, and setting up temporary housing. The Ontario Provincial District Council and LIUNA Local 183, based in Toronto, Canada, are making financial donations to the relief effort and Local 183 is sponsoring an event to collect donations for victims in Ecuador this Sunday afternoon. “On behalf of the half-million men and women of LIUNA and our entire General Executive Board, I want to express our heartfelt sympathy and condolences to the families and loved ones of the victims in Ecuador. We hope that our volunteer team and donations can bring some measure of relief to the survivors,” said LIUNA General President Terry O’Sullivan. The blue LIUNA flag with our seal inscribed with “Justice, Honor, and Strength” (pictured right) is now proudly being flown in Ecuador as LIUNA volunteers work tirelessly to help restore communities affected by the disaster. LIUNA Local 78 is serving as a hub for the collection of donations of food, water, tents, and toiletries for survivors. Donations are being accepted at the Local 78 office which is located at 11-17 43rd Avenue in Long Island City, NY 11101, Monday through Friday from 7 am to 9 pm. In addition, to the volunteer team’s efforts and contributions being collected at the Local, members of Local 78 have also pledged a donation of $23,000 to the relief fund. LIUNA Local 79, which has partnered with disaster-response agency, HEART 9/11, is working with local government officials in Ecuador and private sector firms to assess needs and will be returning with a larger team to assist in rebuilding infrastructure damaged by the earthquakes. Local 79 has a track record of providing skilled assistance during disasters; making three separate trips to assist the people of Haiti in the wake of the earthquake which devastated the country in 2010. Both the Ontario Provincial District Council and LIUNA Local 183 will be making a contribution to relief efforts. In addition, Local 183 will be hosting an event to collect donations for victims of the disaster in Ecuador on Sunday, May 1, from noon to 10 p.m., at LIUNA Local 183, 1263 Wilson Ave., Gerry Gallagher Hall. The event titled, Toronto Gets Moving for Ecuador, will feature various artistic acts, including the Cuban pianist Hilario Duran and the Nicaraguan stand-up comic Martha Chaves from the Yuk Yuk’s roster, along with dozens of singers and dancers. LIUNA was proudly founded by immigrants in 1903 and continues to this day to represent members of many different ethnicities; including many thousands of members of Ecuadorian descent. “Our union is, and always has been, and always will be, a family. The generosity and support from Ray Pocino, LIUNA Vice President and Eastern Regional Manager, Joe Mancinelli, LIUNA Vice President and Central/Eastern Canada Regional Manager, Edison Severino, Business Manager of Local 78, Mike Prohaska, Business Manager of Local 79, Jack Oliveira, Business Manager of the Ontario Provincial District Council, and the disaster relief teams, should be commended,” said O’Sullivan.